At Texas State Optical College Station South, we specialize in caring for your eyes so your eyes stay healthy and your vision is crystal clear. In step with the rapid pace of modern technology, our office is equipped with advanced diagnostic tools to ensure precision. If you’re interested in an alternative to eyeglasses, we’ll co-manage LASIK and other refractive procedures, or fit you with Ortho-k lenses, a new and ultra-convenient method of vision correction. To discuss the current available treatments and what’s appropriate for you, please contact us to book a consultation in our College Station eye care center. Even if you have no vision complaints, it’s critical to have regular eye examinations performed by a qualified professional. Our eye doctor, Dr Jon R. House, will inspect your eyes thoroughly for any signs of abnormality or disease, such as macular degeneration or glaucoma. With kids, our pediatric eye exams may pick up on undetected vision conditions that can impact learning and compromise normal development. We encourage parents to schedule routine eye exams for children at our pleasant, family-friendly practice. Contemporary eyewear should be high quality, as well as provide you with clear eyesight and a great, fashionable look! Our collection of stylish eyeglasses is sure to offer you the perfect solution to support your vision and complement your appearance. With eyewear for every vision correction, including a range of specialty options, our optical staff is waiting to help you choose the most suitable glasses and sunglasses in our collection in College Station. Call for an appointment, or stop by to see all that we have to offer! A thorough eye examination checks for much more than vision quality. Dr. House will inspect your retinal tissues for any abnormalities or signs of disease, taking any health issues or contact lenses into account. Experts advise that everyone, no matter what age, has routine eye exams performed by a professional eye doctor. A one-time, cost-free service provided to all babies between the ages of a half-year and one-year old, these tests enable the early diagnosis of vision and eye problems in young children. TSO College Station South optometrists treat eye emergencies in nearby College Station, TX. Please walk in with red eyes, pink eye, or scratched & swollen eyes for immediate attention. TSO College Station South eye doctors treat children of all ages in College Station, TX. Custom kid friendly eye exams, myopia control, & stylish kids frames. It’s important to stay up-to-date with treatment for your eye disease, such as retinopathy, macular degeneration, cataracts or glaucoma. We are devoted to taking care of your eyes to prevent future vision loss. 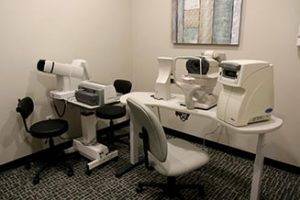 Our TSO College Station South office is fully furnished with the latest optometric equipment to provide you with highly accurate diagnoses and cutting-edge treatment. TSO College Station South's specialized diabetic eye exam detects any diabetes related vision problems minimizing risks to your vision. Schedule today in nearby College Station. Our eye doctor, Dr. House, will meet with you in our College Station clinic to decide if you’re a good candidate for LASIK or other laser procedures. We’ll help you every step of the way, with full pre-op and post-op care. Long, lush eyelashes need not be a dream! Latisse (FDA-approved eye drops) can help you achieve the dramatic look you’ve always wanted. Sometimes eyesight cannot be fully corrected with vision correction, such as eyeglasses, surgery or contact lenses. When this happens, it is referred to as Low Vision, and we have many strategies and devices that will help you live well with this condition. Astigmatism is diagnosed effectively by an eye exam conducted by our optometrist at TSO College Station South. After diagnosis, we’ll decide the most helpful treatment to give you sharp vision. Eyesight is critical for successful education. In addition to being able to read an eye chart, there are many parts of your child’s visual system that must function well for learning. We’ll assess your kid’s eyes to ensure that no vision conditions get in the way of their development.